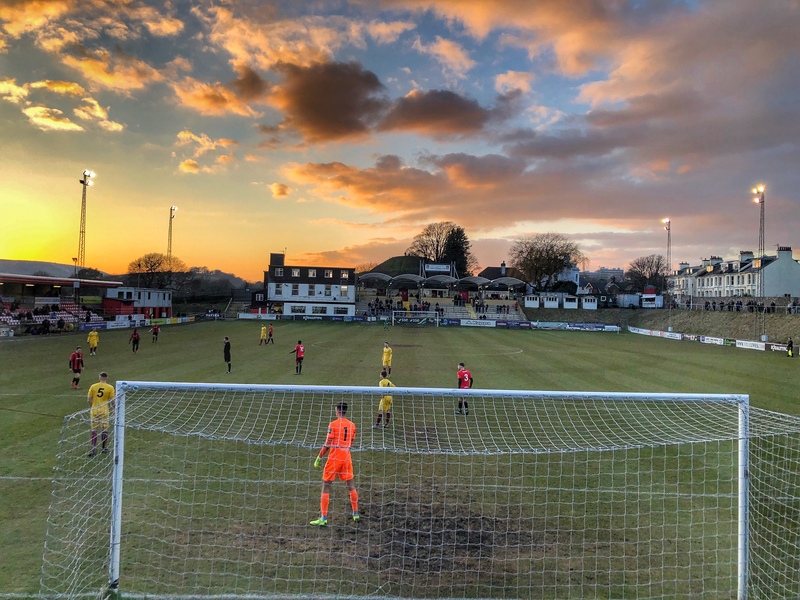 Lewes missed a chance to jump back into third place when they were held to a goal-less draw by a determined Potters Bar Town on a freezing afternoon in East Sussex, reports Stuart Fuller. With Jonte Smith having headed to pastures new in League One and full-back Leon Redwood unlikely to feature again in the foreseeable future after his injury at Harlow Town last week, Darren Freeman was down to bare bones for the game. Some late night phone calls had seen the return of popular full-back Henri Wilder on loan from Mansfield Town, for the remainder of the season. The visitors, with former Rooks Nick Tzanev and George Nicholas in the squad, started the stronger and could have taken the lead in the 7th minute when a header from Hutchinson struck the top of Lewis Carey's bar. Less than sixty seconds later Lewes had what proved to be the best chance of the game when Golding's run and floated cross was met by Omarr Lawson as he charged into the area but he headed the ball into the ground and it bounced up and over the bar with the keeper Tzanev beaten. The game didn't continue in such an attacking vein and it was another twenty minutes before we saw a meaningful chance, again falling to Lawson as his turn and shot from the edge of the area flew wide. Manager Darren Freeman made a tactical switch on the half-hour mark, with Golding and Pamment swapping flanks, and it almost had an immediate impact as Pamment beat his man down the right-hand side and crossed to the far post but Golding could only get a knee to the ball and it flew over. The final chance of the half fell to the visitors as Budden headed over from what was almost under the Rooks cross-bar from a corner from the left-hand side. It was the visitors who started the second half the sharpest, with Lewis Carey having to get down low to stop a shot from Bettache. The Rooks had their best period of the game in the next fifteen minutes, firstly when Pamment again skipped passed two challenges on the edge of the box and teed up Golding but his shot was blocked by Budden. The Rooks number 7 then had a chance of his own as his shot from wide on the left of the penalty area flew just wide with the keeper rooted to the spot. The two Potters Bar centre-backs saw yellow within sixty seconds of each other, Grace for a late tackle on Hammond in a move that saw a low cross from Henri Wilder met by Pamment 12 yards out but he blasted over and then Budden for a meaty challenge on the same Rooks player. Two minutes later Harry Reed went into the book too for a needless reckless challenge on the Potters Bar 11 by the touchline. In the 66th minute Luke Blewden had a great chance from a cross from Wilder but he could only get a shoulder to the ball and it went tamely wide. Freeman made his three changes as he looks to get some attacking intent into the Rooks but it didn't have the desired effect as the visitors went into the last ten minutes the stronger, with Carey and Chappell having to make important blocks as Potters Bar sensed they could get an unlikely victory. However, their cause wasn't helped when substitute and former Rook, George Nicholas hacked down a surging James Hammond, looking to break through the Potters Bar back line. In the ensuing melee in the middle of the pitch, referee Ions showed Nicholas the red card. Despite five minutes of injury time added, the Rooks couldn't muster another chance and had to settle for a second successive 0-0 draw here at The Pan. You can read a copy of today's E-Prog here. The Rooks have an opportunity to return to winning ways on Wednesday night when fellow Play-off chasing Tonbridge Angels visit the Pan, kick off 7:45pm. Stay up to date with news and club announcements.. Most soccer clubs are privately owned, with wealthy investors ploughing investments in with their own cash. We do things differently, because this is unsustainable. Lewes FC is run by the people, of the people, and for the people. This is our declaration of football independence - which means you (yes YOU!) can be an owner of our club.